The greatest adventure a man ever lived ... with a woman! At the start of World War I, German imperial troops burn down Reverend Samuel Sayer’s mission in Africa. He is overtaken with disappointment and passes away. Shortly after his well-educated, snooty sister Rose Sayer (Hepburn) buries her brother, she must leave on the only available transport, a tired river steamboat The African Queen manned by the ill-mannered bachelor, Charlie Allnut (Bogart). Together they embark on a long difficult journey, without any comfort. Rose grows determined to assist in the British war effort and presses Charlie until he finally agrees and together they steam up the Ulana encountering an enemy fort, raging rapids, bloodthirsty parasites and endlessly branching stream which always seem to lead them to what appear to be impenetrable swamps. Despite opposing personalities, the two grow closer to each other and ultimately carry out their plan to take out a German warship. Back in mid-2000, I took a look at the AFI’s “100 Greatest Movies” list and realized that I’d already reviewed quite a few of them. Intrepid young man I was, I decided to take on all of them. That task may sound daunting, but since it meant I’d write up most of them when they got their initial release, I didn’t have to do that much all at once. Online rentals allowed me to fill in gaps with then-released DVDs, and I picked up the rest when they eventually hit the shelves. Some came out quicker than others, though. By October 2007, 99 of the 100 films had come out on DVD; The Jazz Singer was the release that pushed the list close to completion. And then I waited. And waited. And waited some more. Finally, March 2010 allows me to complete our AFI 100 page, as we now have 1951’s The African Queen - that last cog – available on DVD. Set in German East Africa circa the early days of World War I, where Rose Sayer (Katharine Hepburn) and her brother (Robert Morley) serve as Christian missionaries. This ends when German soldiers round up the locals and burn the village. The experience causes the brother to suffer a mental breakdown, and he dies before long. With no reason to stay, Rose seeks to depart – and to avoid future encounters with the Germans. This places her on board “The African Queen”, a steamboat that traverses the river under command of its seedy, salty captain, Charlie Allnut (Humphrey Bogart). He seems happy to hide out and wait for the war to end, but she wants to find a way back home to England. This sets the unlikely pair on a difficult journey out of Africa, one on which they will also do their part for the war effort. You can place Queen on the fairly long list of movie classics I saw years ago on VHS but hadn’t viewed as an adult – or at least not past the age of 20 or so. In the back of my head, I maintained a memory of dissatisfaction with the flick, but don’t ask me to explain why; I know I didn’t care for it but I couldn’t discuss my specific complaints. I suspect I didn’t much care for it because it lacked a particularly dynamic plot. Ostensibly a “war flick”, Queen is really a character piece. Indeed, the entire scenario that launches the journey seems like little more than an excuse to plop the staid, stuffy Rosie in close quarters with the earthy Allnut. They could’ve been stuck on an island or snowbound on a mountain; it would’ve made little difference in terms of story development. Which means Queen lives or dies with the lead characters. For the most part, it entertains, especially during its first half. Inevitably, Rosie and Charlie eventually become lovey-dovey, and the movie loses some dramatic steam when they do. It compensates with a greater level of action and adventure, but the characters become less interesting to me. Bogart won an Oscar for his work as Charlie, and I suspect that was one of those career recognition awards. I don’t want to slight Bogart’s turn here, as he’s entertaining and charming. However, I find it hard to imagine many film fans would now defend Bogart’s performance as the best of 1951 when he came up against Brando in Streetcar. Bogart’s Charlie is a likable cartoon character and that’s about it. Which comes as a definite contrast to Hepburn’s much more three-dimensional Rosie. Both characters start out as caricatures, but only Rosie manages to grow beyond that level. Hepburn provides the more natural performance of the two, and she grounds the film on an emotional level. My minor criticisms of Bogart’s performance aside, the pair do have a good chemistry. I suspect that’s the reason Queen remains regarded as a classic. With lesser actors, I don’t think the movie would stay lodged in the cinematic consciousness, as I don’t think there’s much else about it that’s particularly special. Oh, it’s an enjoyable ride, with some fun character moments and a dollop of good action. But if you lose the two cinematic legends as the leads, I really doubt that Queen would be seen in the same light. Granted, one could say the same about many movies, but I believe Queen would show a bigger decline with other actors in it. With Bogart and Hepburn at the fore, however, African Queen provides an enjoyable adventure. Do I really think it’s one of the 100 best movies ever made? 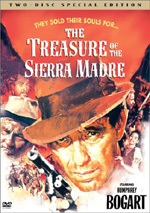 Nope – it’s not even my favorite of the collaborations between Bogart and director John Huston, as I prefer both The Treasure of the Sierra Madre and The Maltese Falcon. Still, it’s a charming romantic action flick that still holds up well after almost 60 years. Footnote: the release of African Queen allowed me to complete both of the site’s AFI 100 pages. It was also the final component left to fill out the AFI’s 2007 update. I hate to admit it, but I’m almost sad that I’m finally finished with the page. This day has taken so long to get here that it’s kind of anticlimactic! 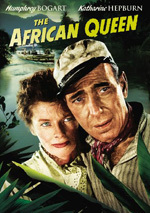 The African Queen appears in an aspect ratio of 1.33:1 on this single-sided, double-layered DVD; due to those dimensions, the image has not been enhanced for 16X9 televisions. While unhappy with such a long wait for this DVD, fans should at least be very pleased with the high quality of this transfer. Sharpness was surprisingly good. A little softness affected some wide shots, but the majority of the flick appeared pretty concise and well-defined. Close-ups of Katharine Hepburn tended to be the fuzziest, but this appeared to be a visual choice to soften the appearance of an aging actress; I didn’t think it was a transfer-related issue. No concerns with jagged edges or shimmering occurred, and edge haloes were absent. Source flaws also created no concerns, as the movie boasted a clean presentation. Like many Technicolor movies, Queen came with a slightly brownish tint. That also fit the film’s setting, though some brighter colors appeared as well. I thought that the hues looked fine given their restrictions, and when allowed to do so, they could be quite vivid. Blacks were dark and dense, while shadows came across as concise and clear. This was one of the best SD-DVDs I’ve seen in a while, as it did justice to the film. On the other hand, the monaural audio was a bit on the feeble side. Mastered at a low level, I needed to crank my receiver’s volume much higher than usual to get to a listenable place. Even then, the track seemed somewhat thin and nondescript. Speech remained intelligible, but the lines could be brittle. Still, they weren’t bad, as dialogue was often the best aspect of the track. Music appeared a little shrill and lacked much low-end. Effects weren’t much better, as those elements appeared fairly wan and lackluster. Given the restrictions of the source material, I thought a “C” grade was in order, but more dynamic mastering might’ve made this a more acceptable auditory presentation. Since it took forever for the much-lauded African Queen to hit DVD, you might expect a wealth of supplements. You’d expect wrong. The only real extra comes from Embracing Chaos: Making The African Queen, a 59-minute, 24-second documentary. It provides notes from novelist CS Forester’s son John, critic/historian Richard Schickel, film historians James Ursini and Rudy Behlmer, James Agee’s biographer Laurence Bergreen, filmmakers Martin Scorsese, Mark Rydell, Norman Lloyd, Steven Charles Jaffe and Nicholas Meyer, Bogart biographer Eric Lax, Sam Spiegel biographer Natasha Fraser-Cavassoni, assistant director Guy Hamilton, actor Theodore Bikel, John Huston biographer Lawrence Grobel, producer Sir John Woolf, Katharine Hepburn biographer William J. Mann, script supervisor Angela Allen, clapper boy Desmond Davis, Lauren Bacall biographer Brenda Scott Royce, Bogart friend Warren Stevens, Huston’s son Tony, publicist David Lewin, director of photography Jack Cardiff, and Hepburn friend John Philip Dayton. Hepburn and Huston and also appear via archival footage. “Chaos” looks at the source novel and its slow path to the screen, notes about cast and crew, the era’s social climate and its impact on the production, some story/character areas, shooting in Africa, various technical challenges and cinematography, general anecdotes, and the film’s reception and legacy. While I’m disappointed in the paucity of bonus materials, at least “Chaos” offers a good look at the film. It moves at a brisk pace and digs into the flick with pretty good gusto. We find a nice exploration of a variety of subjects in this enjoyable, informative piece. The disc opens with an ad for Paramount’s “Sapphire Series” of Blu-rays. This also appears under Previews. No trailer for Queen shows up here. While not the best of the John Huston/Humphrey Bogart collaborations, The African Queen provides a likable romantic adventure. 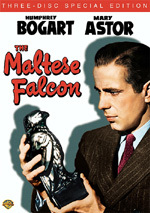 It works mostly due to the chemistry of its leads, as the interaction between Bogart and Katharine Hepburn elevates the material. The DVD boasts excellent visuals but the audio seems lackluster. In terms of supplements, we only get one, but it’s an engaging documentary. The absence of more substantial bonus materials disappoints, but the film receives good treatment here.